If you read my blog three or four weeks ago, you would have found me in a really good place. I had just ran a super fun track meet and kept a really strong pace and I was enjoying getting in some daily runs with friends. The past three weeks? Not so good. Three weeks ago we had a very tragic and unexpected death in our family which put things to a screeching halt. Suddenly my days were spent consoling family and working hard to make sure everyone had what they needed. There was a lot of sitting and a lot of eating. At first I didn’t eat at all. Not for two days. But then the shock slowly wears off and the emotional eating begins. And that’s okay. Sometimes when tragedy hits it is vital to put other’s needs before yourself, even if it means not exercising and not eating a proper diet. And that’s okay, too. That’s all I’m going to say about that. I’ve had this race on my calendar for about a month. It fell on my very best friend’s birthday and she was itching to run a sub 30. I mentioned it to my other running friend, Brittney and she signed up also. When I hopped on board for it I had planned on having some stellar runs but as I mentioned earlier, life gets in the way. I was not excited about running this race and really thought about not doing it even though DNS-ing would leave me with no August race. When Ashley told me she hadn’t actually registered and wasn’t really feeling up to race it made me even less thrilled. But people were counting on me to show up and I didn’t want to break my goal of doing a race every month. The night before I talked a big talk to Brittney about having a 2013 PR and we chatted about outfits and race strategy. Race morning was a whole different ballgame. I was excited, I was pumped, but mentally I was not in it. Brittney and I started together but I let her run off before we even hit a quarter of a mile. My heart was beating out of my chest, I couldn’t breathe to save my life and everything on me hurt. Not a good sign so close in. I repeated every mantra I could think of and begged my legs to magically get strong and carry me down Cherokee Boulevard. No such luck. So I eventually just sucked it up and walked. Actually I walked almost the entire time except for little spurts where we were going downhill. I ran when I could and then owned the fact that I was walking. When we had less than a half mile to go, there were these awesome dudes from Fleet Feet in tutus running in the distance behind me encouraging people to run. They were shouting things like “don’t let me catch you.”. When I could see the finish line in sight I took off very slowly. I was running and I didn’t care what my pace was. Brittney was in the distance and she ran me in. There was a lady that I had played cat and mouse with in front of me and I didn’t want her to beat me so I took off in what I consider a dead sprint and passed her just before crossing the timing mat. Some fantastic volunteers handed me a bottle of water and I just laid in the grass. Brittney and her husband came over and talked to me and I wanted to kick, scream, fuss, and cry over the fact that I had just taken 38 minutes and 30 seconds to do a 5k. But I didn’t. Sure I complained (something I never do) but having friends there made it so much better. Not to mention both Brittney and her husband ran superb times! Looking back on the race I’m disappointed in my time. But then I think about the fact that I kept with my goal of doing a race every month this year, I got to catch up with one of my best gal pals, I got to celebrate Ashley’s birthday even though she wasn’t there, and I got in a workout for the day. How can I complain about that? Sure, I could make excuses and blame other people or the situation that has occurred over the past three weeks but I won’t. I didn’t do my best and I’m okay with it. Life happens, life doesn’t go according to your own grand plan, but it’s OKAY. I just have another 5k bib to add to my collection. 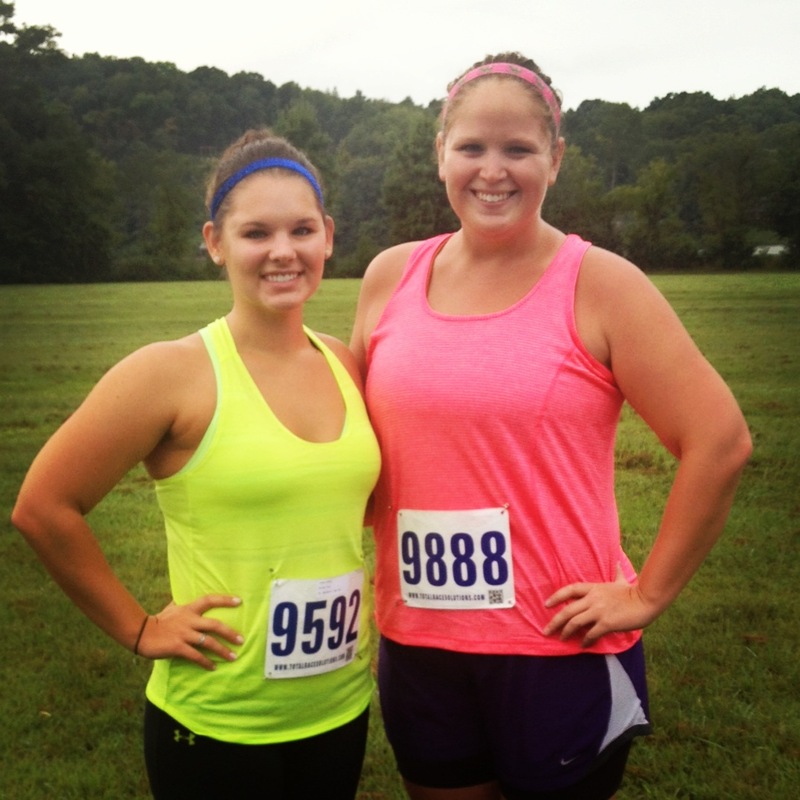 This entry was posted in Race Recaps and tagged butterfly fund 5k, having a bad race, knoxville running, race recap by thegogirlblog. Bookmark the permalink. Thank you, Samantha. I appreciate that. Life always seems to “happen” at the worst possible times, but it is how we react and come back that counts. I am thankful for your kind words. Way to get your walk in, that is awesome!!! We’ve all had races that didn’t go like we wanted, ESPECIALLY after taking time off. (Which, by the way, you had a totally valid reason to cut back on your workouts and training. I’m so sorry for your loss.) You’re totally right that the fact that you went when you had the perfect opportunity to back out and stuck to your goal is a HUGE reason to applaud yourself. Most people would have backed out. I consider every bad race a good workout. Sometimes it’s not in the cards, and that is A-OK! I’m sorry you didn’t have a great race but it’s okay on to the next one! It just wasn’t your day, there will always be another day! i always say it’s the crappy runs that make us appreciate the amazing runs! That is so true, Missy! Thanks for sharing. Sorry to hear about the tough time in your family life. It’s tough to keep up with fitness when you’re dealing with tragedy, so way to finish, even if you feel terrible about the time. Did your friend get her PR? Proud of you regardless of time, numbers are just numbers in the grand scheme of things, right? It was so nice catching up working around our hectic schedules. Annnnd, don’t forget the Rita’s! Can’t forget the Rita’s…that you stood in line for and did not eat.